Capacity obtained after charge at 0.1C for 14 hrs and discharge at 0.2C to 1.0V at 25oC. 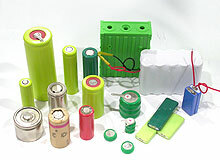 Battery manufacturing standard according to IEC 61951-2-2001 (4.4). "T" behind the model name stands for high temperature version, as 60HT, 180HT. Numbers 01-06, 08-011, 11-13, 21-26 and 31-36. --The No. 07 welding tag is made of Ø0.8mm pure nickel material thread. --The welding tags of Numbers 41-44 are stainless steel sheet.